A lot has happened the last week or two, and it appears like the S&P 500 has entered the ‘post panic’ stage. Before we discuss the typical ‘post panic’ pattern, here is a brief recap. On June 9, we went short the S&P 500 at 2,110. This was our insurance trade against lower prices (unlike an actual insurance policy, this trade didn’t cost anything). On June 19, which was five days before the Brexit vote, the Profit Radar Report was looking for “an early week bounce, followed by a late week sell off,” which is pretty much what happened. Somewhere in between the bounce and sell off is an interesting tale about what happened to our short position. This tale is told here. The question, after the S&P lost 122 points in three days, is: What’s next? The S&P 500 has not reached the ideal target zone, but odds are decent it will (eventually). It appears like the S&P is now tracing out this ‘choppy bounce.’ Tuesday’s strong surge brought the S&P 500 almost back to 2,040, which was prior support, and is now resistance. Normally we’d say that a move above 2,040 would unlock further up side (and it probably will), but post panic moves tend to be choppy and unpredictable, likely to seesaw across support/resistance levels. 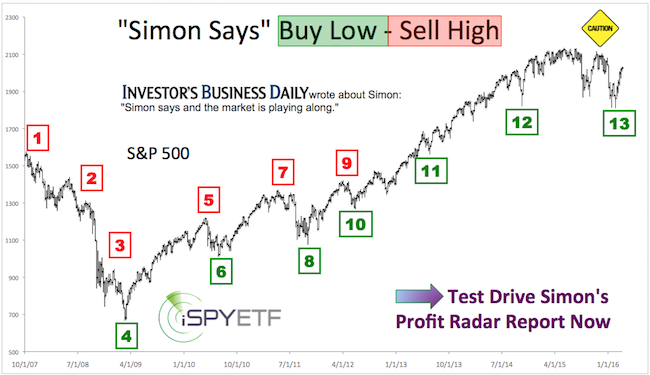 While the daily price action may become irrational, the Profit Radar Report identified a post panic pattern the S&P adheres to about 7 of 10 times. We discussed this pattern after the initial January panic decline here … and it ultimately helped us to buy on February 11 at S&P 1,828. Most indicators thus far suggest this post panic pattern will be one of the 7. The latest Profit Radar Report update outlines this specific pattern. Of course, we never completely rely on any particular patterns, but use our indicators to either confirm or invalidate, and adjust accordingly. Continued updates are available via the Profit Radar Report. Allow me to tell the painful tale of a perfectly timed short S&P 500 trade. This is a classic example of where doing what is right feels so wrong. Via the June 8, Profit Radar Report, I recommended to short the S&P 500. We called this the most promising setup since we bought the S&P at 1,828 on February 11. The short entry turned out to be perfectly timed as the market sold off right afterwards. The market proved the above headlines wrong just one day after they were written. “In terms of seasonality, the week after June Triple Witching has been dismal, down 10 of the past 11 years. Based on Elliott Wave Theor,y the S&P finished 5-waves up to complete wave 1 on June 8 at 2,120.55. Next should be a wave 2 decline. Waves 2 tend to retrace a Fibonacci 50% – 61.8% of the prior move. The ideal target range for a wave 2 correction is 1,970 – 1,925. However, prior to resuming the down trend, the S&P may bounce to 2,090 – 2,110. It would take a move above 2,121 to unlock a much more bullish wave structure. The chart below (published along with the June 19 Profit Radar Report) highlights the mentioned down side targets. As it turns out, the market followed the ‘script’ almost perfectly. It rallied the first part of the week, and sold of the last part of the week. However, … there was one big problem. The first and only time the Profit Radar Report mentioned the Brexit vote was on June 22, when it provided a timelime for when the UK vote results would be released. In short, vote results would be available Friday around 7am GMT, which is 3am EST, which means Wall Street would be closed and subject to massive gap up or down open. That was the biggest risk for investors and our S&P 500 short position. “Our biggest worry is finding the best stop-loss level. The S&P is already nearing an oversold condition as it’s approaching the first support zone, which increases the odds of a bounce. Based on the open chart gaps, a bounce above 2,110 (our entry level is possible). 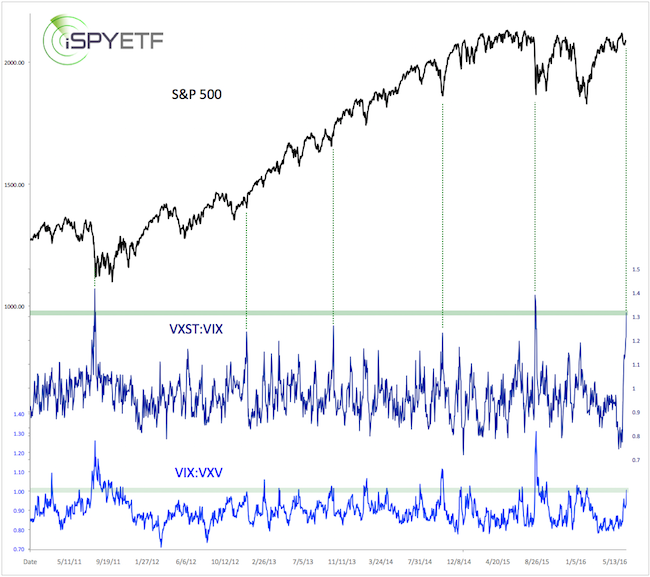 On Wednesday before the vote, two VIX-based indicators registered sentiment extremes that have led to rallies on the past. On Thursday before the vote, the S&P 500 moved above 2,110. This stopped us out of our short S&P 500 position at breakeven … at the worst possible time. The next day, the S&P gapped lower and dropped to 2,054 within the first hour of trading. Unfortunately we weren’t on that bus. A couple of decades of managing other’s people money have taught me to always err on the side of caution. Although much of the evidence suggested a resolution to the down side, holding on to the short position overnight would have been closer to gambling than prudent risk management. Due to the time difference between the UK and the US, and the associated gap up or gap down open, prudent risk management was impossible. Although we’d love to have made money of the post-Brexit meltdown, fortunately the worst-case scenario for us is to be out of the market while many other investors are suffering a big hit on their portfolio. Still, never has doing the right (the prudent) thing felt so wrong. Up until now, iSPYETF did not participate in the Brexit discussion. Why? Until the votes are cast and counted, it’s all speculation. We can’t predict the outcome of the vote and how the market reacts. We are right at 2,110, just a few hours before Britain heads to the polls. According to the BBC, polls will close on Thursday at 22:00 GMT (3:00pm PST, 6:00pm EST). The ballot count is expected to start as soon as the polling stations close. Credit Suisse estimates that about 25% of the votes will be counted by 3:00am GMT (8:00pm PST, 11:00pm EST), 50% of the votes will be counted by 4:00am GMT (9:00pm PST, 12:00am EST). There will be a rolling total so the time at which one side reaches the point of being mathematically unbeatable depends on how quickly the vote are counted and how close the results are running. Some expect the final result on Friday around 7:00am GMT (12:00am PST, 3:00am EST). In other words, Wall Street will likely be closed when the results come in. This may well result in a gap up or gap down open on Friday morning. Risk adverse investors who don’t want any voting-related risk, should close out positions before the end of close today. 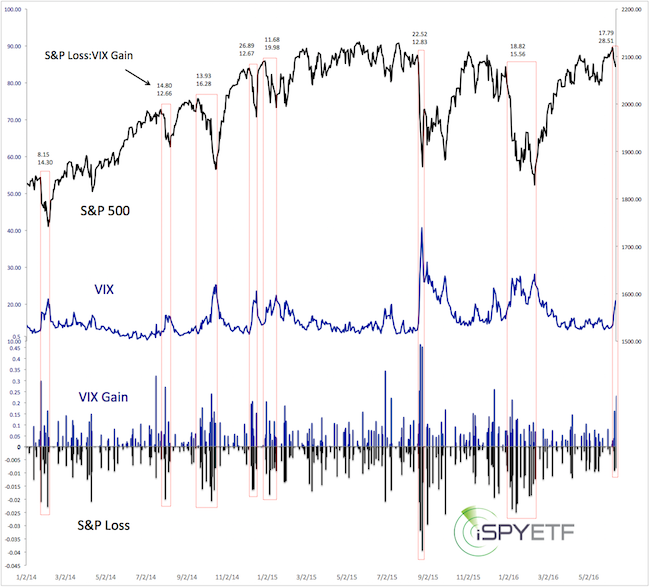 Looking at the volatility correlation between various time frames can provide helpful clues. For example, the expectation of increased short-term volatility relative to long-term volatility (VIX/VXV ratio above 1, or VXST/VIX ratio above 1.2) is usually a contrarian indicator. When investors brace themselves for more immediate volatility, the opposite tends to happen and stocks move higher. Investors are bracing themselves right now. The first chart plots the S&P 500 against the VXST/VIX and VIX/VXV ratio. Short-term volatility is elevated relative to longer-term volatility. The VXST/VIX ratio is at 1.31. The dashed green lines show that similar readings in the past coincided with market lows. The VIX/VXV ratio is at 1, which is elevated as well. However, VIX seasonality is nearing the best buy signal of the year. Based on Elliott Wave Theory, the S&P 500 is at or near a significant inflection point (fork in the road). According to the charts, stocks are at or near an important inflection point, and the Brexit vote may be the catalyst for the next move. The market could break into either direction. 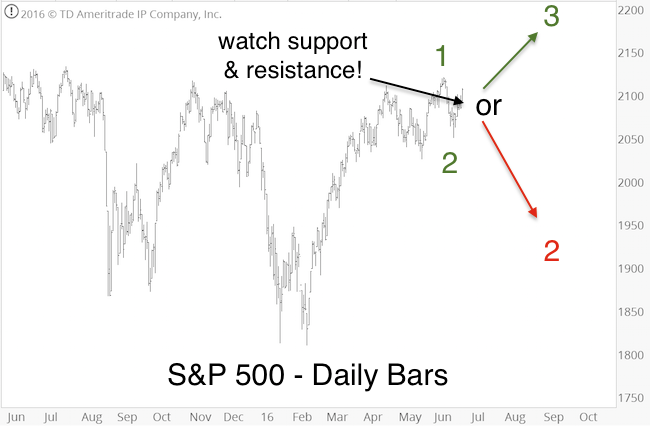 Now is the time to watch important support/resistance levels. Trade above resistance is likely to send stocks significantly higher, while a drop below support should lead to a sizeable correction. The S&P 500 is enjoying its largest 1-day pop since May 24. Is this a dead cat bounce or the beginning of a new up trend? What caused this bounce will help us figure out whether it has legs. Monday’s pop comes on the heels of an interesting losing streak. The S&P was down 6 of the prior 7 days, but lost only a relatively tame 3.31%. There was nothing tame about the VIX’s reaction however, spiking as much as 67.08% (see chart below). We termed this the FOMO insurance trade. What is a FOMO insurance trade? FOMO stands for ‘fear of missing out.’ Having insurance allowed us to watch the S&P losing streak knowing that we’ll make money as the market drops (and if it continues to fall). Insurance usually comes at a price. However, with our stop-loss at break even, our insurance came free and offered the mental peace only a well-timed entry can provide. 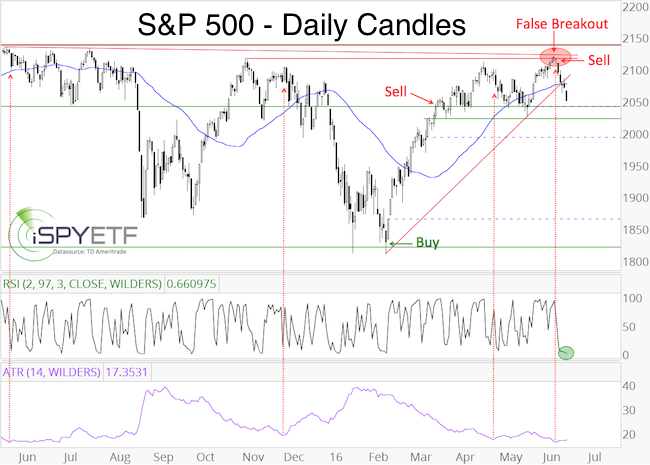 At Friday’s close, the S&P 500 carved out a bullish divergence (see chart below – published via the June 19 Profit Radar Report). This bullish divergence combined with an oversold condition caused Monday’s bounce. 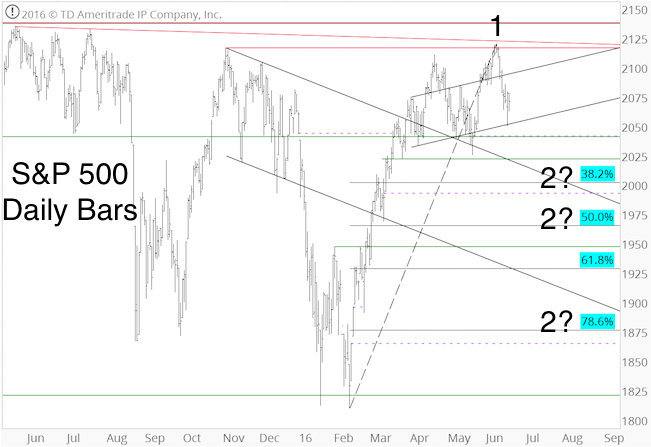 Thus far, the S&P remains in the 2,090 – 2,110 target/reversal zone. Bearish post Triple Witching week seasonality suggests this is just a dead cat bounce. In terms of actual trading recommendations, 2016 has been a fairly quite year for the Profit Radar Report. We’ve had only seven actual trade recommendations (only one losing trade). Until last week, the only stock-related trade was the S&P 500 buy at 1,828 on February 11 (closed on March 17 for a 11.6% gain). Based on hindsight, not trading the choppy range from March 20 to June 8 has been the right decision. Starting on May 24, the Profit Radar Report was looking for a false S&P 500 breakout and subsequent reversal. 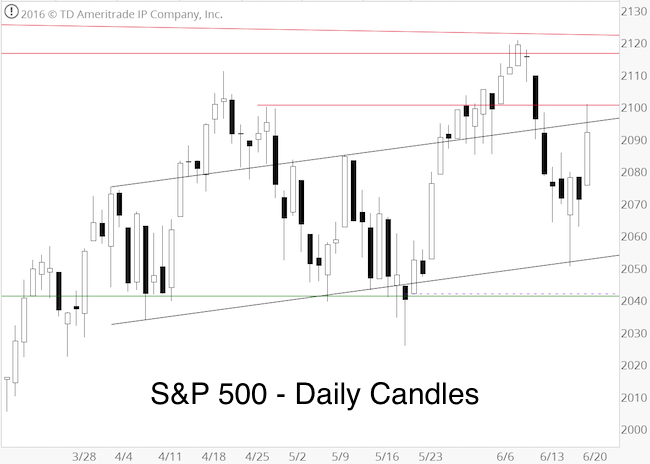 After stalking the S&P 500 for two weeks for a low-risk entry, our carefully selected short trigger was met at 2,110 on June 9 (click here for more details on how we ‘stalked’ the S&P and avoided shorting prematurely). The corresponding ETF trade was to buy the ProShares Short S&P 500 ETF (SH) at 19.80. This became the first S&P 500 trade since February 11, 2016. What’s special about this trade? The chart below (published in the June 8 Profit Radar Report) shows that the ATR (average true range) dropped to the lowest level since June 29, 2015. ATR is a measure of volatility, and it showed a dangerous level of complacency (dotted red arrows). As the horizontal red lines indicate, there was a cluster of resistance levels at 2,110 – 2,139. There was also an obvious bearish divergence on the hourly chart (not shown). In short, the S&P was ripe for a reversal in a strong resistance range. The ingredients for a pullback where in place. 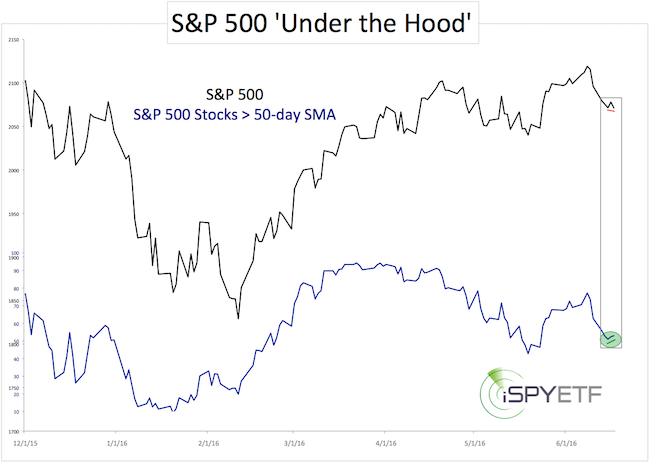 The fact that the S&P 500 was near its all-time high (which means considerable down side potential) added to the intrigue. The decline since the June 8 high has been kind of odd. The S&P 500 has been down for six consecutive days, the VIX went soaring (click here for recent VIX anomalies), but the S&P loss has been relatively small (2.8%). At this point, the S&P is oversold, by may have entered a powerful wave 3 down (according to Elliott Wave Theory). 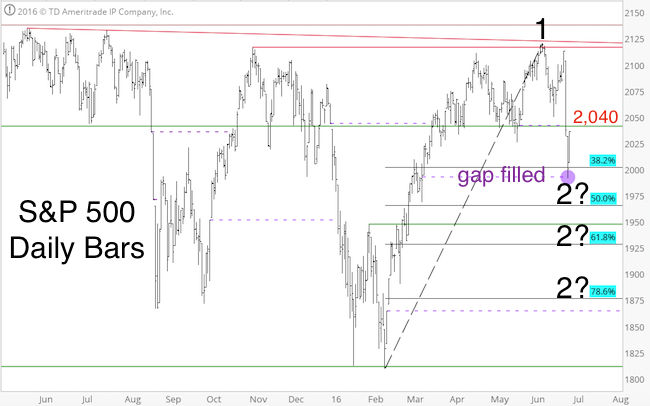 There are a number of open chart gaps, which suggest that the S&P will recover once this correction is done. VIX Spikes 64% in 5 Days – What Does this Mean? The recent VIX behavior has been unprecedented. The VIX gained 64% from June 14 – June 20. 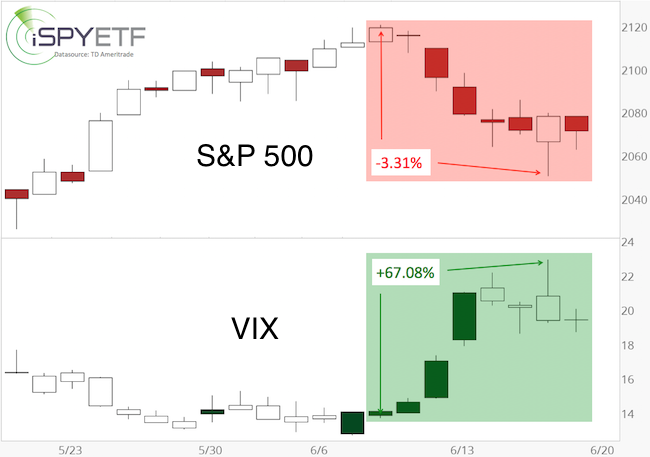 The VIX gained 41% on June 10 and June 13, while the S&P only lost 1.72%. 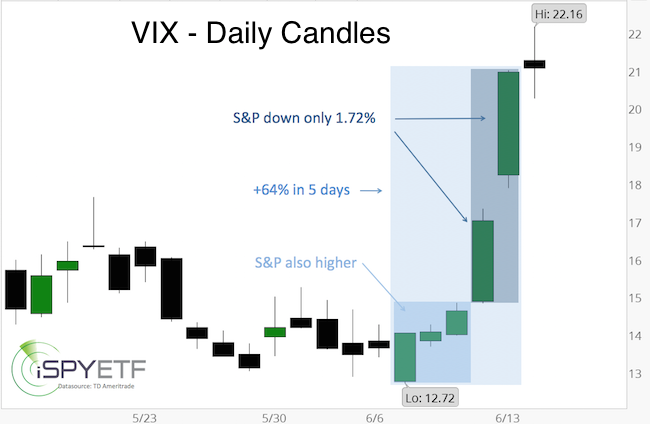 On June 7, 8, 9, the VIX moved higher along with the S&P 500. While the scope of the VIX spike is unprecedented, a higher VIX was to be expected. Barron’s rates the iSPYETF’s Profit Radar Report as a “trader with a good track record.” Click here for Barron’s assessment of the Profit Radar Report. The next day, the S&P started falling and the VIX starting soaring. On Friday June 10, the VIX spiked 16.33% despite a subdued S&P 500 loss of only 0.92%. The chart (updated chart shown below) plots the S&P 500 against the VIX. The lower panel shows S&P 500 losses and corresponding VIX gains. The dotted red boxes highlight various declines since the beginning of 2014. The numbers above the red boxes reflect the ratio between VIX gains and S&P losses (i.e. Friday: VIX of 16.33 divided by S&P gain of 0.92 = 17.79) recorded during the first few days of the decline. On the next day (June 13), the VIX spiked 23.14% despite another tame S&P loss of only 0.81%. As the updated chart shows, the ratio of 28.51 has become very unusual. History suggests that the VIX is due for a mean reversion move (lower). XIV is usually a good vehicle for this mean reversion trade, but it is worth noting that contango tends to turn into backwardation when the VIX sustains trade above 20. The Profit Radar Report kept it simple and recommended to short the S&P 500 at 2,110. Continued S&P 500 and VIX analysis is available via the Profit Radar Report. Last week’s update titled “Bears Get Another Shot at Taking Stocks Down” listed four reasons why bears get another shot and two reasons why stocks may continue higher. This may sound like a contradiction, but it’s actually not. Basically we were looking for a good low-risk opportunity to go short. The higher stocks go, the better the opportunity (as long as you don’t short too early). How exactly does being ‘careful about initiating our short-trade’ look like? We use support/resistance levels to our advantage. The hourly chart below shows why 2,084 was important. A drop back below 2,084 would have triggered our sell, but as the green arrows indicate, the S&P 500 never drop that low. It touched the 2,088 – 2,085 zone four times, but bounced every time. Anticipation of a potential ‘flush the bears spike’ combined with a carefully placed sell trigger kept us in the neutral zone instead of the losing side. 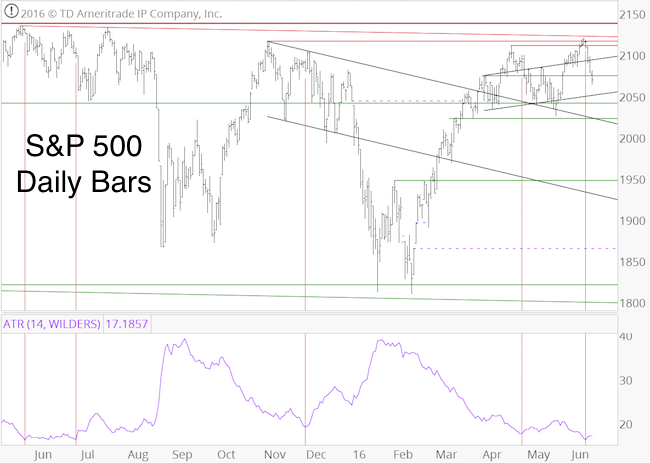 As the S&P 500 continued to rise, we elevated our sell trigger. 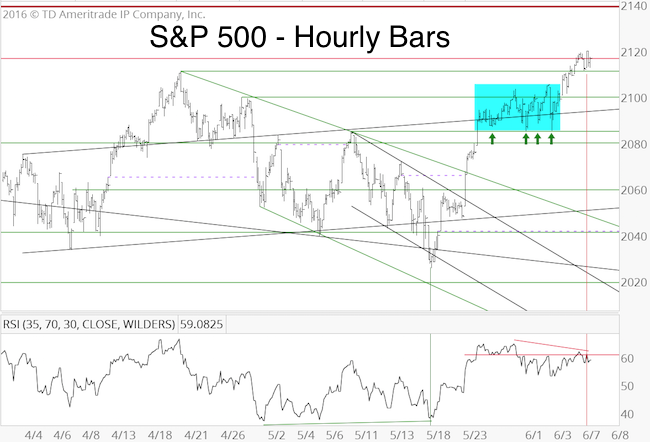 The S&P 500 shows a fairly drawn out bearish RSI divergence on the hourly chart, and – unlike the S&P 500 – the Dow Jones has not yet surpassed its April high. This rally doesn’t have the typical ingredients for a sustained breakout. This trade is not one to be rushed, but unless breadth picks up, odds continue to favor a reversal lower in the not so distant future.